Large supply of St. Croix, Fenwick, Berkley, Pinnacle, Castaway, and G-Loomis Fishing Rods. Daiwa, Shimano, Penn, Okuma and Marado Reels. Reef Runner, Storm, Yo-Zura, Bagley, Rapala, and more fishing Lures. The only place you can find "Frans Favorite" the original "Weapon". Also supplies for building your own Lures by the piece or in Bulk. 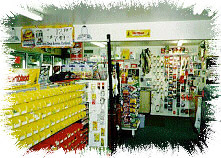 Spinner blades, quick release clevis, beads, hooks, snelled hooks, etc..